To understand what i am trying to do look at the below sequences where when user click on the button i will disable the button & after completion the button will enable soon. If you redirect from this page then no problem. Where cmdSubmit is our button which we dont want to click twice or more. 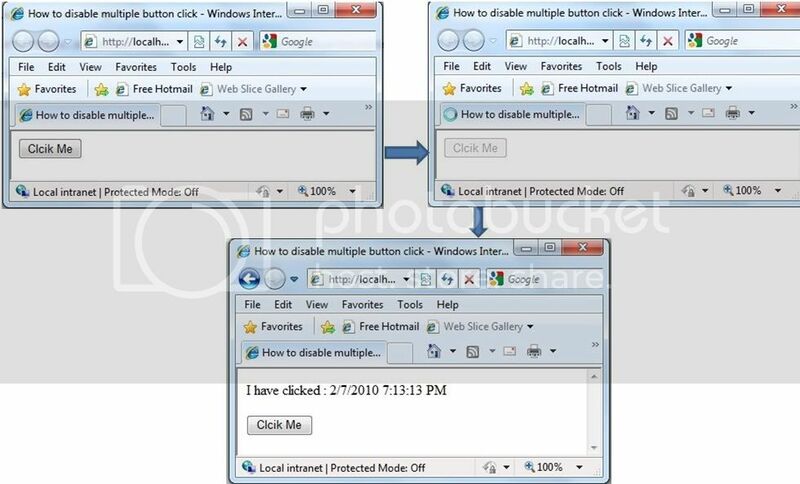 Hope now you can restrict or prevent the user from twice or more than one or from multiple mouse click. Oh noh another version has been release this year blogengine 1.6. It has new additional features now it can prevent comment spam filter that has ability to plugin custom filtering modules.It has improve outgoing emails and more improvement and fixes for this 1.6 version. given above code is working Local but after deployment is not working on azure.